Pipe Dream Archives Senior guard Marlon Beck scored 5 points in BU’s loss to Hartford. The frustration of the Binghamton men’s basketball team could be seen on the worked-up face of BU assistant coach Bryan Goodman, who stood just off the court with his hands resting on top of his head. Goodman’s reaction to junior forward Bobby Ahearn’s foul of Hartford redshirt senior guard Jalen Ross with 56 seconds remaining told the disappointing story of the Bearcats’ 76-69 loss to the Hawks (9-21, 4-11 America East) on Wednesday. BU head coach Tommy Dempsey pounded the floor. Senior guard Marlon Beck stood next to the key with his hands on his hips. Hartford sealed the game after hitting seven of eight free throws in the final minute. The Hawks handed BU (12-18, 3-12 AE) its seventh straight loss — BU’s longest losing streak during conference play in three years. Going into their game against the Hawks, the Bearcats found themselves tied for second-to-last place in the AE. But even wins against similarly ranked teams are hard for BU to come by now. BU now finds itself in sole possession of eighth place. While they put up a fight in the closing minutes against the Hawks, the Bearcats have consistently faltered in the second half of games this season. With 39 seconds remaining, BU cut the deficit to three points. By then, however, BU had already started to strategically foul Hartford players. Against the Hawks, that late push wasn’t enough. As a team, BU struggled defensively. The Bearcats were unable to effectively guard Hartford’s offense without fouling it. BU sent the Hawks to the free-throw line 37 times and Hartford made 87 percent of its shots from the charity stripe. BU shot 40 percent from the floor and 29 percent from 3-point range — both higher than Hartford’s marks. The Hawks shot 36.7 percent, including 8-for-28 from beyond the arc. Sophomore guard Everson Davis led the Bearcats with a career-high 19 points in 24 minutes of play. Davis shot a 40 percent clip from the field, but went just 1-for-5 from beyond the arc. He was followed by sophomore guard Timmy Rose and junior forward Bobby Ahearn, who contributed 13 points each. Despite working on his shooting last summer, Davis has struggled to convert his success in practice to game-time situations. He has averaged 5.3 points per game so far this season. Earlier this season, recorded nine wins in nonconference play — its most as a Division I program. 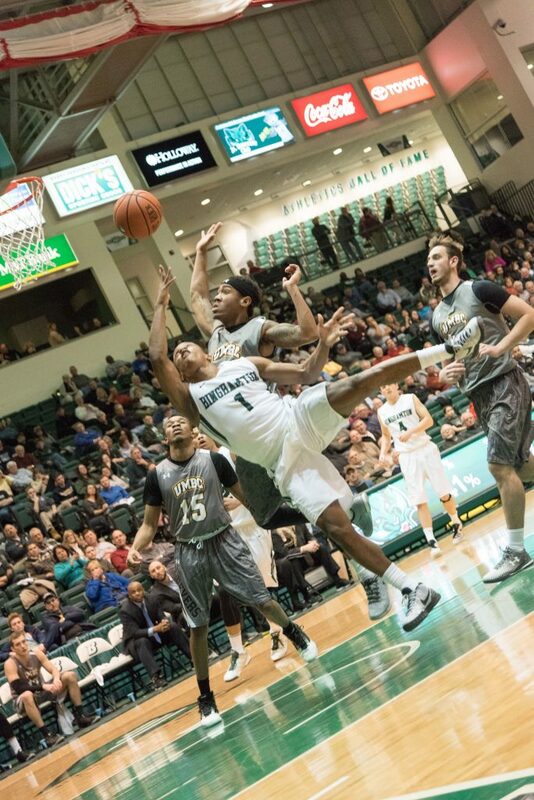 But since then, the Bearcats have struggled against AE opponents. An injury to redshirt sophomore guard J.C. Show late in nonconference play derailed BU’s once-lofty aspirations. Over the course of the season, BU has struggled to shoot, and its defense has been invisible at times. The Bearcats are set to finish regular-season play against Maine on Saturday. Tipoff is scheduled for 2 p.m. from the Events Center in Vestal, New York.